I had to get up real early on this 2nd day, at 6:30 am. I didn´t eat breakfast with my host family, because we, all of us on this trip, got a french breakfast in School, with croissants and pains au chocolats(very good), I have a weakness for good foods… It´s wierd to say a very typical french breakfast, because all of us got a french breakfast in our host familys, every morning, but well. It was still yummy. After eating we learned all about the french school System and were shown the building. In France one school hour is 55 minutes long, and the students hardly participate in class, the teacher talks, the students listen, sometimes they read, but mostly they write in their enourmous notebooks, one for each subject, which is alot to carry. They have alot of exams and tests. And when the teacher is done with correcting and kows their grades, he reads it to the whole class, each and every grade. No privacy. Which brings us to the next point; their grades. Their grades go from 0 to 20. 20 is the best 0 the worst, and if you have a 16, 17 or 18 you can be really proud of yourself. That´s something like an A or A-, and it is hard to achieve. 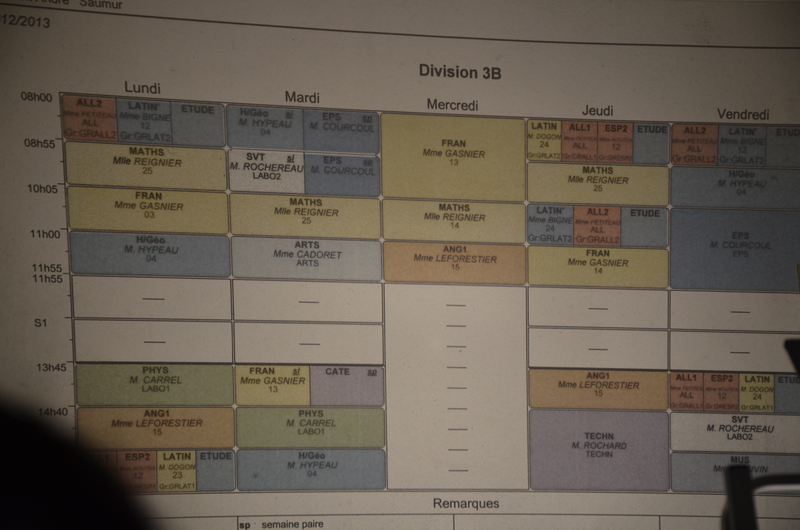 Their scheudule is packed from 8 am to 11, then a break, then again lessons until 3:45 pm. . They have to write alot and when they get home late from school, they have at least 1-2 hours of homework. Pretty tough! From the school we went around town with a tour guide, all morning. She showed us the really cute town, told us about the history of buildings and of Saumur. Saumur is a small town in the west of France, right at the riverbanks of the Loire. You could walk from one side of the town to the other and it would only take you about 3/4 of an hour to an hour, if you don´t stop at every of the small stores. There are a lot of those in Saumur, but sadly almost no more cute french boutiques. Actually, I didn´t find a single one! 😦 I found all kinds of shops, which I can find exactly the same ones at alot of places in this world. But, I guess, if you owned a boutique in a small town like Saumur, you wouldn´t be able to maintain it, unless you want to go in the red. With all those rivals like H&M. Well, there is also a rather big mall in this little town, with a big supermarket and shops like Sephora and H&M. I found a french chain, named ChacheChache, where I baught a pretty jeans blouse. Finally, something french. Ok, Sephora is french too. The streets of Saumur are rather narrow, and the houses small, pretty and cute. There are no high buildings, let alone skyskrapers. All houses have no more than 4 or 5 storys. Very cute everything! After that tour(we didn´t go to that mall, I went there later) I went “home” for lunch and we had salad and baguette with cheese and then “Pâtes à la carbonara”, which are spagetti with cheese, bacon and raw egg yolk. I know, raw?? Yes, the yolk was actually raw, everyone got one on their plate and had to put it in their spagetti themselves. It was again very good. They were really battening me ;-). Then we drove again to the school where everyone met their exchange partner. We all missed the bus so we walked, which wasn´t bad because I got to know more of the town and we passed a supermarket, where i baught a toothbrush, which I had forgotten. At their house, we snacked andd then drove to her(my exchange partner) tenniscourt, where she had tennis practise. 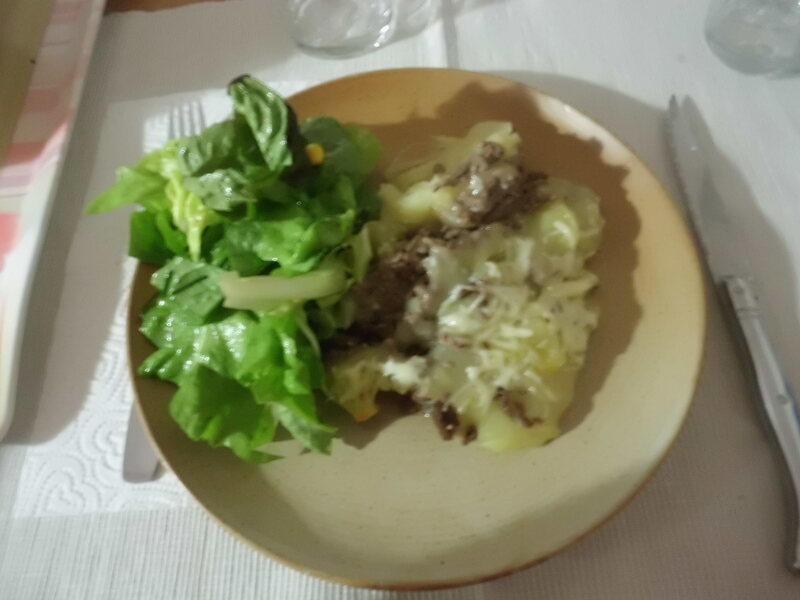 After that, we ate “hachis parmentier”, which is ground meat on the bottom and on top mashed potatos, all scalloped with cheese. With that we had salad and baguette. That was the second day in Saumur!! Hope you liked it! If you did please let me know by pressing the Like-button below! Thanks!